3.1 inches (80mm) cutting capacity. 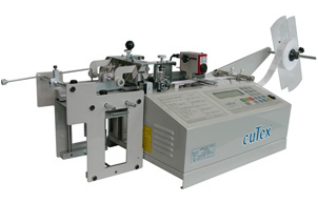 Cold cut, guillotine style cutter. With the flip of a switch, labels will be cut and stacked. -Cutting length is accurate owing to a stepping motor. -Cutting is neat due to using a cold cutter like scissors and blades are durable because they are made of high-speed steel(HSS). -It works automatically only by setting length and quantity. -It stops automatically if material runs out during operation. -Set-length, set-q'ty & set-speed are not erased even if power off & on.